Android App for Phone Story Released! An Android app of "Phone Story" was released this morning, less than a day after Apple pulled it from the iTunes store. By rejecting the app, Apple has made sure that this phone story isn't just about horrible labor conditions in the life-cycle of mobile phones, it's now also about censorship and the chilling effects Apple's policies have on content. There's a nice article on it, including interviews with the game developer Molleindustria, here in the Guardian. Hours after being publicized, after only 1000 downloads, the Phone Story app was removed from the iTunes store. There is some news about it... stay tuned for more! To the great surprise of its creators, a funny new iPhone game critical of Apple's human rights record was accepted by the iTunes store and is being released today. The app, called Phone Story, teaches players about abuses in the life-cycle of the iPhone by putting them in the manufacturers' shoes. To win, players must enslave children in Congolese mines, catch suicidal workers jumping out of Chinese assembly plant windows, and conscript the poorest of the world's poor to dismantle toxic e-waste resulting from obsolete phones. The seriously funny new game will sell for 99 cents on iTunes; all proceeds will go to organizations fighting to stop the horrors that smartphone production causes. Read more about Phone Story below. But first, a word from Phone Story's sponsors. Since our fundraising appeal is doing so well, we're launching our very own curated page on Kickstarter, to support other cool projects—like Beautiful Trouble, an activism manual and website written by over forty troublemakers from around the world, including the Yes Men. Beautiful Trouble's goal is to put the best tactics for creative action in the hands of the next generation of change-makers. Support Beautiful Trouble! Would you like to force an African child to mine for precious metals at gunpoint? "Phone Story," a new iPhone app produced by Molleindustria, puts the player in the unsavory shoes of a smartphone executive. Each level in the game explores a different real-life problem in the consumer electronics life cycle: slavery and abuse in Coltan mines, suicide-inducing manufacturing plants, and health-destroying e-waste processing are reduced to a cute, low-res aesthetic driven by simple, addictive game play. The game is available in the iTunes store for 99 cents. "We wanted to get this story into the hands of consumers, on the shiny devices we love to use but are causing this depraved, destructive cycle," said game developers Paolo Pedercini and Michael Pineschi. The site provides links to organizations with campaigns to hold phone makers accountable for their horrors, and 100% of proceeds go directly to such organizations. Apple has a well-documented and controversial history of keeping apps that they don't agree with out of the hands of consumers, so it came as a big surprise to the creators when the iPhone store accepted this one. "If this simply slipped under their radar, we can't wait to see how they respond," said Pedercini. "If it's creative enough, we might have to build a whole other level." 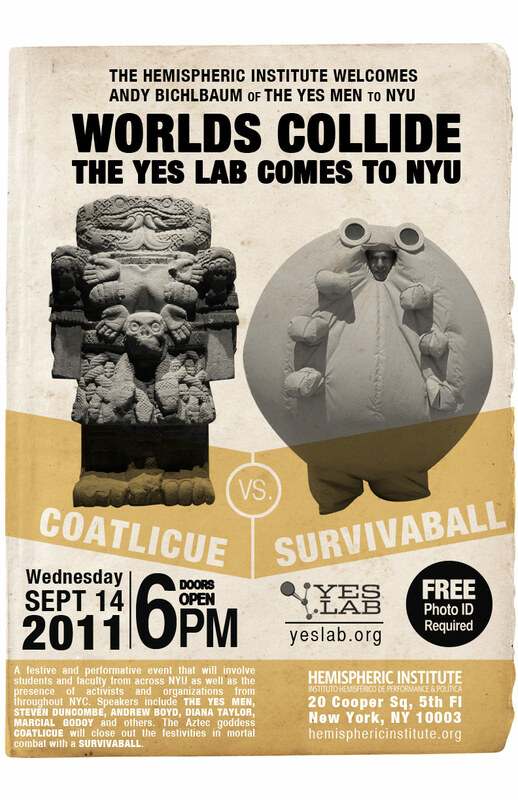 Help the Yes Lab develop some cool new tools! The “Actipedia,” an open, user-generated database of activist projects, a project of the Center for Artistic Activism and the Yes Lab. The basic framework has been built, but now needs to be fleshed out and many bells and whistles added. An “action portal” (no real name yet) that will allow users to submit project proposals and solicit collaborators from the Yes Lab database. If you’d like to help out with either of these projects, please write us! Come drink wine, win prizes, watch videos, and watch the Aztec goddess Coatlicue battle a Survivaball. Also, hear about the Yes Lab's near past and future from the Yes Men and others. Free (but photo ID is required).